Divide the sweetened condensed milk among six 4-ounce canning jars. (If desired, add a flavoring from the list below to each jar.) Secure lids. Place in a slow cooker; add enough hot tap water to cover by 1 inch. Cook on low for 11 to 12 hours, or until thick and richly colored. (To check doneness, remove a jar with tongs. If the color looks good but you aren't sure if it's thick, you can open a jar to check consistency. If necessary, secure lid again and return to cooker for another hour.) 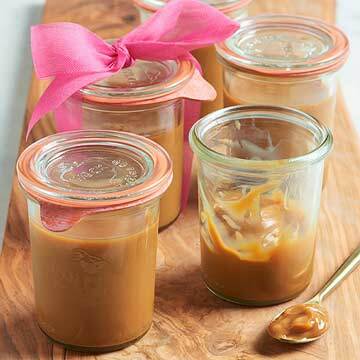 When dulce de leche is fully cooked, remove all jars with tongs. Cool to room temperature; store in refrigerator up to 3 weeks. I love the little canning jars you used. Can you tell me the brand or where I could get them? Midwest Living here! Submerge the jars—put in enough water that it comes to about an inch above the top of the jars. Hope that helps!